Thought this (the only pic I ever took of a Burrows bus) might be of interest. 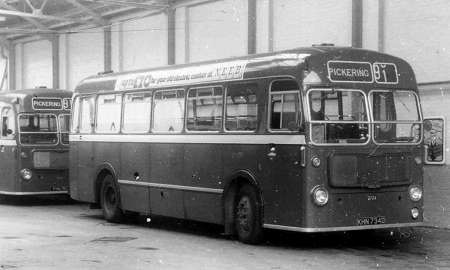 Fleet No.89 registration PWY 943 an AEC Regent V with Roe L27/26RD body, new in 1956 and Burrows’ last new decker. 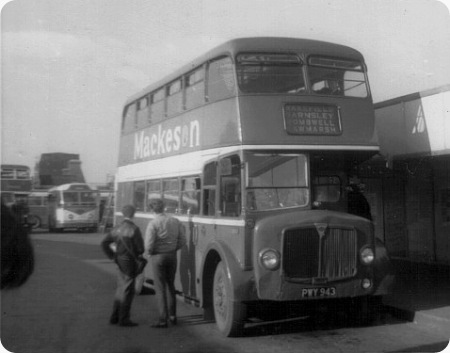 The picture was taken on the occasion of a PSV Circle tour from Manchester in 1965. Our transport, a North Western Bristol K5G can be seen at the far left, cooling down after its climb over the Pennines. We had to form a bucket chain at one point to extinguish the smouldering cab floorboards but did manage to overtake a Bedford coach as well! Operators visited on this tour included Phillipson’s of Goldthorpe (lots of Royal Tigers), Mexborough and Swinton and Rotherham Corporation. Was your K5G the North Western one on the Halifax Parade? Whilst I remember the North Western K5G’s in service my memories of riding them date from the preservation era. Boy were they rough riders! Sitting on top deck at the front your nether regions got every vibration from the engine and gearbox. It’s a tribute to those Willowbrook bodies that they lasted so well under those conditions. I bet the original bodies didn’t need much removing – they probably self-destructed. Looking at the ‘Halifax Parade’ link was very enjoyable. I think I was there. The shots of the service buses in the background reminded me what a superb livery Halifax had. It even managed to make the ‘Orion’ body design look passably attractive! 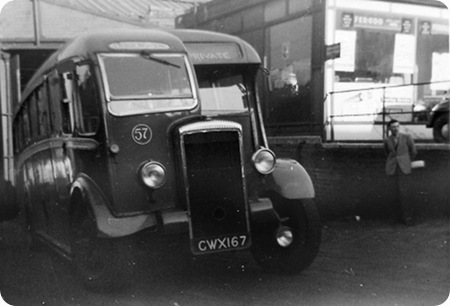 In 1967 this bus was with Richards Bros, Moylegrove.